104 MMS October 2017 mmsonline.com BETTER PRODUCTION Shops Using Technology L.A.Y. 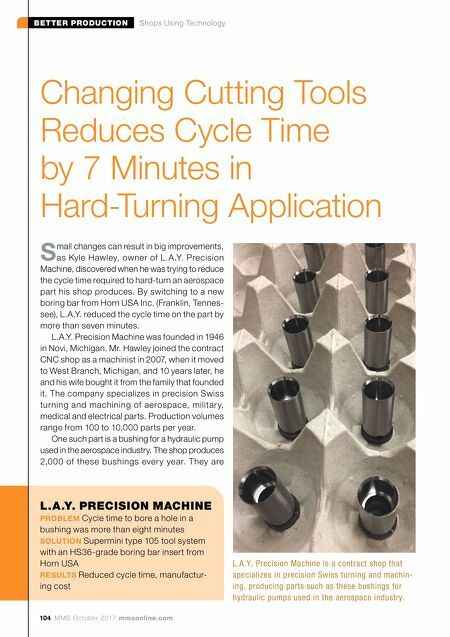 PRECISION MACHINE PROBLEM Cycle time to bore a hole in a bushing was more than eight minutes SOLUTION Supermini type 105 tool system with an HS36-grade boring bar insert from Horn USA RESULTS Reduced cycle time, manufactur- ing cost Changing Cutting Tools Reduces Cycle Time by 7 Minutes in Hard-Turning Application S mall changes can result in big improvements, as Kyle Hawley, owner of L.A.Y. Precision Machine, discovered when he was trying to reduce the cycle time required to hard-turn an aerospace part his shop produces. By switching to a new boring bar from Horn USA Inc. (Franklin, Tennes- see), L.A.Y. 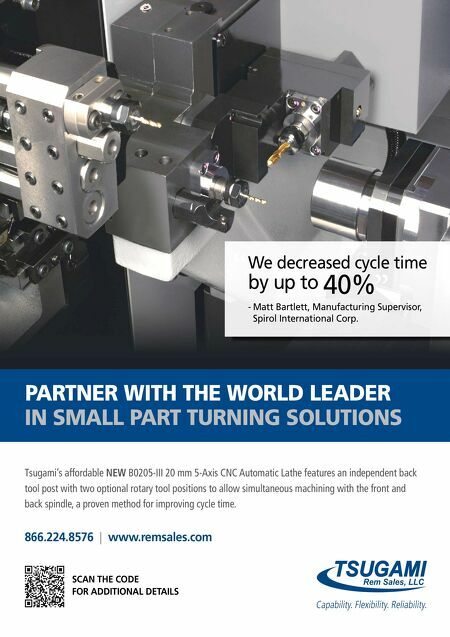 reduced the cycle time on the part by more than seven minutes. L.A.Y. Precision Machine was founded in 1946 in Novi, Michigan. Mr. Hawley joined the contract CNC shop as a machinist in 2007, when it moved to West Branch, Michigan, and 10 years later, he and his wife bought it from the family that founded it. The company specializes in precision Swiss turning and machining of aerospace, militar y, medical and electrical parts. Production volumes range from 100 to 10,000 parts per year. One such part is a bushing for a hydraulic pump used in the aerospace industry. The shop produces 2,000 of these bushings ever y year. They are L.A.Y. Precision Machine is a contract shop that specializes in precision Swiss turning and machin- ing, producing parts such as these bushings for hydraulic pumps used in the aerospace industry.